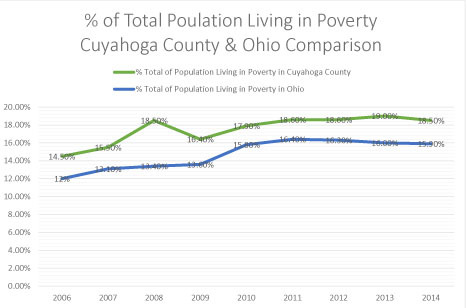 As the graphs suggest, the total percentage of population living in poverty did decrease in 2014 in both the state of Ohio and in Cuyahoga County. There is also a consistent decrease in the number of estimated homeless people at a state and a county level-from 23,512 individuals to 21,512 in the county (a percent change of -7%). At a state level, a decrease from 148,250 individuals in 2013 to approximately 109,649 individuals in 2014 (a percent change of -26%). 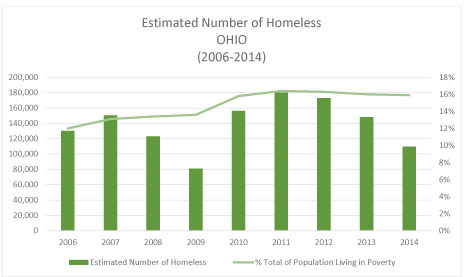 It’s not surprising that the number of homeless individuals has decreased, as we based our calculations off of both the total population and the % of that total population living in poverty, and both numbers have decreased (reflecting overall trends in census data in the Northeast Ohio region). 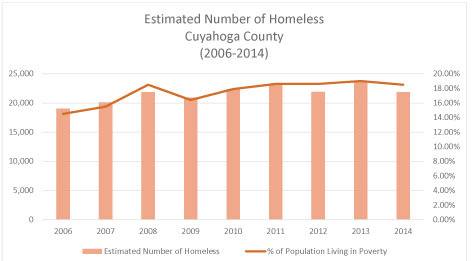 What remains an interesting finding in the state level data in regards to % of those living in poverty and estimated homeless individuals in 2008 and 2009, is that it does not reflect the trends we saw in Cuyahoga County. This could be explained by many factors, most significantly perhaps, the housing crisis that hit Cuyahoga County especially hard: see this link here for more information on foreclosures compared to other counties in the state of Ohio. Although the data suggests that things are getting better, it’s important to recognize that the percentage of individuals living in poverty remains consistently higher in Cuyahoga County compared to the rest of the state. It is imperative that we identify how we can best break the cycle of poverty before it continues to cause homelessness in our community. Prevention is key, and we must continue to work together with advocates, business owners, nonprofits and community stakeholders to address homelessness in Cuyahoga County. 21,512 is far too many individuals to be without stable and decent shelter in our community. You can see the 2014 data that this analysis is based off of here. Project Act is a program for homeless children through CMSD to address children who are experiencing homelessness, staying in emergency shelters, staying with friends or family because of the loss of housing or due to economic hardship (Project Act). This program offers direct instructional support as well as access to support programs-this year alone, 2,646 children are experiencing homelessness. A large part of this initiative is measuring just how many children are experiencing these unstable housing situations or homelessness in the district, and what those children who are experiencing homelessness look like. This year the program found that over 2,646 children in our community are experiencing these conditions. Although, a significant reduction from 4,048 the approximate number of children experiencing the same conditions during the 2014-2015 year (1402 less individuals experiencing homelessness or similar unstable situations). This is a percent change of -34.63%, which is an encouraging statistic, although all is well when you really analyze the data and find the disparities of those who are experiencing childhood homelessness or other strained housing situations. It is concerning that 13.8% of the population experiencing these conditions are five or under. Even more horrifying is the disparity that exists among racial lines within the district. With 83.4% of the population experiencing these conditions being African American-while just 6.5% are white children, which happens to be the second largest group represented in the total 2,646 number. If you look at the numbers by Homeless Codes, you will see that by far the largest group represented are children who are doubled-up with friends or family-representing approximately 67.6% of living situations that these children are experiencing. The second largest represented category are children living in homeless shelters, or 20.6% of the measured total population. As mentioned previously, the total population of children experiencing some form of homelessness during last year was 4,048. Children under the age of five, represented 13.4% of the total population of children experiencing homelessness. African American children still represented the largest population represented, at 81.4% of the measured population, white children still comprised the second largest part of the population at 8.8%. When we analyze the data by homeless codes, we see that 70% of the children experiencing homelessness were doubled up followed by 16% of the population in homeless shelters. Measuring Progress or lack thereof? Although, there was an overall reduction in the number of youth and children experiencing homelessness reported in the 2015-2016 year, it is important to note that disparities continued to grow within the youth population experiencing homelessness. Younger children still continue to experience the highest levels of homelessness, and African American youth are still disproportionately impacted by housing instability. To see the numbers for yourself, you can follow this link for this year’s numbers and learn more about the Project Act Program here. Just as it is important to not recognize changes and decreases in the data as actual progress, it is paramount that we keep a critical eye on the above figures, and continue to work towards an overall reduction in homelessness.